Brigsby Bear opens with footage of a children’s show about a bear who travels around the galaxy fighting evil while preaching life lessons. Through the VHS tracking lines, teachings include advanced mathematics with proverbs like “Curiosity is an unnatural emotion” thrown into the low-budget action. It’s ridiculous and charming. 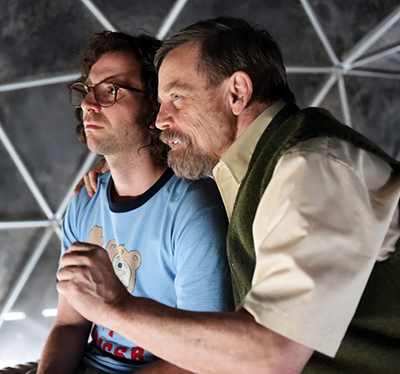 Those are also two primary aims of Brigsby Bear, but it doesn’t push far enough in either direction, never fully embracing weirdness and failing to fully tap into the appeal of its premise. 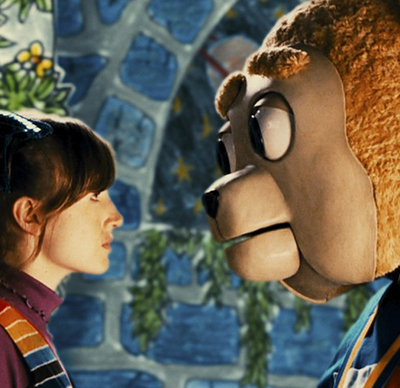 It turns out that “Brigsby Bear Adventures” is fictitious in more ways than one. 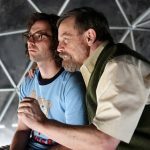 The show exists only for James (Kyle Mooney), who lives in a bunker with Ted (Mark Hammill) and April (Jane Adams). The 25-year-old has been a devoted Brigsby fan for life and struggles with the truth when police show up at his underground home. Ted and April had kidnapped James when he was a baby and produce the weekly show as a parenting (and hostage conditioning) mechanism. Having trouble adjusting to a more “normal” life with his real parents (Matt Walsh and Michaela Watkins) and sister (Ryan Simpkins), and without his favorite phony TV personality, James sets out to make a Brigsby Bear movie to finish the story. The quest for closure via artistic expression, both as a fanboy and as someone dealing with a traumatic experience, is disappointingly undeveloped. For a stretch, the film gets by on an offbeat mixture of the weird bunker ordeal, clips of the goofy faked show, and Mooney’s polite naiveite as he experiences the real world. Instead of delving deeper into the thematic possibilities, however, the script, co-written by Mooney and Kevin Costello, only sporadically addresses the anxiety or gloominess of the situation for James or those around him. 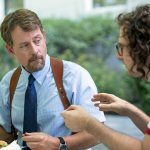 Director Dave McCary embraces the child-like wonder to a soppy fault, undermining some of Mooney’s noble attempts at quiet, nuanced desperation. James surrounds himself with the comforts of his passion – a huge collection of ringer Brigsby t-shirts, etc., but the security-blanket references and humor from his innocent lack of social skills are repetitive and recycle basic motivations. 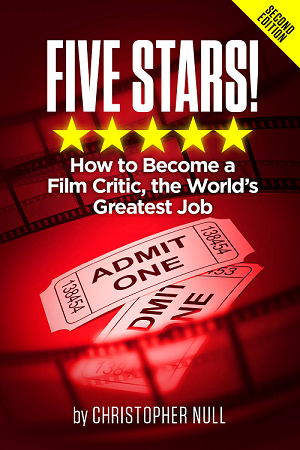 The mission to finish the film-within-the-film feels more like convenient filler than an exploration of James’ enthusiasm or how throwing himself into his quest helps him cope. Connections between family sessions with a serious therapist (Claire Danes) and the comfortable nostalgia are loose and fail to address real critiques of pop-culture mania or the joys of following whimsy. McCary takes a “no judgements” approach designed to showcase James’ man-child exuberance, but it leaves the film’s constant attempts at charm feeling cold and without meaning. Simplicity extends to the assortment of supporting characters used to illustrate the delights of following your dreams and the depressions of giving up on them. James conveniently meets his sister’s kind friend Spencer (Jorge Lendeborg, Jr.), who is accepting of all of his quirks and also happens to be an aspiring filmmaker with a camera. Meanwhile, Detective Vogel (Greg Kinnear), who’s working the kidnapping case, did some acting when he was younger but now eats a bagged lunch alone outside of the police station. Vogel’s realization when James tells him bluntly (but sweetly, of course) how it’s so sad he gave up thespianism illustrates Brigsby Bear’s meager inspiration. McCary’s meticulous staging of the Power Rangers-esque small-screen oddity are the highlight of the film and may stir up some levels of nostalgia for those inclined, but the translation of themes isn’t nearly as thorough, making Brigsby Bear feel like a missed opportunity.